Seeing things that shouldn't be burned get melted down to nothing by fire is weirdly titillating. You don't even have to be a pyromaniac to enjoy the perversion of the flames. Just look at how this tooth slowly disappears! It's gross and weirdly wonderful in all the right ways. So bless the master torch wielders of Cars and Water for taking a tooth from their childhood and blasting it with a hydrogen/oxygen flame. 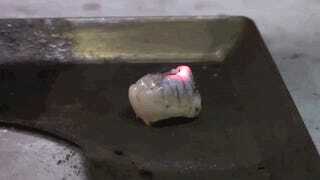 I thought I would never know how a tooth burns. Now I'll never smile the same again.